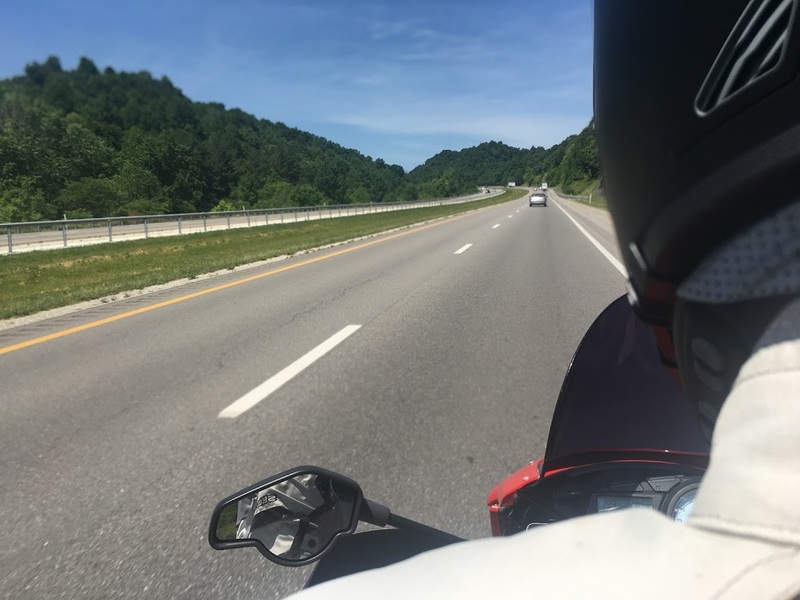 The ride started out flat and uneventful. We passed by a gang of bikers riding Gold Wings and my rear end was feeling a little jealous. Sitting on a motorcycle is far less comfortable than riding in a car. We found a cute little diner just off the highway and stopped for lunch. As we were leaving the diner, we felt a few rain drops. We decided to go for it, hoping to get ahead of the rain, but no such luck. 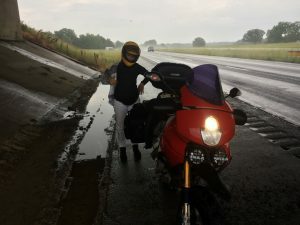 A few minutes after getting on the highway, it was starting to pour down heavily and we stopped under an overpass to put on the little extra gear we had. After getting rather soaked for the next 30 minutes of riding, we finally got out of the rain, the warm air came back and we started to dry out. However, after another 60 miles, the rain was returning. Not wanting to get wet and cold again, we pulled into a Starbucks. The Starbucks was of no help, they had their AC set to 60. It was warmer outside under some awnings. We waited for more than an hour, but the rain just didn’t seem to wanna stop. There was no end to it, so we decided to power through to the end. We only had another 40 mins or so to the hotel we had already booked. Naturally, we got soaked and even got stuck in some traffic in St Louis. When we finally got to our hotel around 7 pm, they told us they didn’t have any rooms ready. Seemed rather odd, but after waiting soaking wet for 30 mins, we finally got it sorted, got our keys and jumped in the shower to warm up. Luckily, the hotel had a laundry machine, so we could dry all our wet clothes. Our sidebags are soft and 100% of all our clothes got soaked. By midnight, we had it all cleaned and dry ready for the next leg.